Situé à seulement .7 miles de Jay Peak, notre condo de 3 chambres peut accueillir jusqu'à 8 personnes. Il a un lit king dans le maître, lit queen size dans la deuxième chambre, den avec grand canapé-lit et salle de jeux dans le niveau inférieur avec canapé-lit queen size. Le niveau inférieur dispose d'un sauna et d'une baignoire romaine à jet, parfait pour se détendre après avoir skié le meilleur terrain de l'est. Apportez vos maillots de bain et vos patins à glace pour profiter du fantastique parc aquatique intérieur de Jay ainsi que de la grande patinoire et de vos clubs de golf pour jouer sur son terrain de golf. Dînez dans l'un des excellents restaurants locaux ou préparez vos repas à la maison dans la cuisine équipée d'un réfrigérateur, d'une cuisinière et d'un lave-vaisselle. Jay est un paradis pour le ski, la randonnée, le vélo, le golf en plein air et le plaisir pour tous. S'il pleut, le parc aquatique est là pour que vous ne perdiez pas une journée de plaisir en vacances. This place is super close to Jay Peak and can comfortably fit a good size group. Three floors of living area with a bathroom on each floor. The owner was very responsive and our stay was enjoyable! Highly recommend! 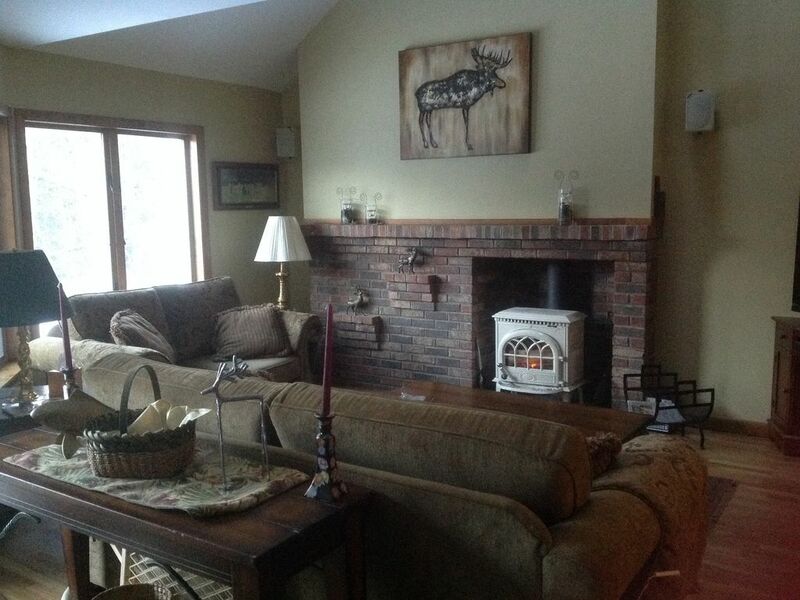 This condo unit was a great place for our family to stay for a ski / Jay waterpark vacation WITH the dog. There's a quiet road 100 yards away for dog-walks and the place is about a mile from the ski area. My son was initially disappointed that we couldn't locate the mini pool table but the foosball was a distraction so all was well in the end. In spite of it being a pet-friendly place, it was spotless with no smells or signs of animals. The kitchen was spotless and stocked with everything you could need. We tried to play music but the speakers only emitted a quietly muted tinny sound. All in all these were small inconveniences and easily overlooked by how great everything else was in the condo. We were warned that the door latch could be difficult and we found we had to lock the door to make sure it didn't blow open. You won't be disappointed with this rental. This 3 level townhome was roomy, comfortable and clean. Really enjoyed the sauna, super convenient inside in the lower level. We cooked most evenings and the kitchen was well stocked with cookware. Marc was easy to work with. Condo has everything you need and is described perfectly. Towels and linens were appreciated as well as the kitchen stocked for cooking. The living room with the fire stove made it cozy. Dinner table also. We never used the sauna or the games table. Plenty of games available too. The condo is closer to the small town of Jay. The Belfry is half way to Montgomery where you can get a bite to eat. Each town have great restaurants to eat. Great place. Enjoyed our mini ski trip. Thanks to Marc for helping us with a later check out. Would highly recommend..
Great, spacious, welcoming home. Everyone loved it. The Roman tub and sauna an added bonus! We spent 3 nights here in late Dec. it worked out great for us. We had 2 adults, our 3 kids and two of their friends. Everyone had enough space including the dog! Marc was very responsive and helpful!